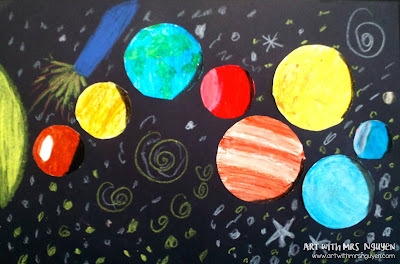 Lesson idea found at Deep Space Sparkle. For this lesson we began by comparing and contrasting an image of a circle and a sphere and talked about what attributes made the sphere look 3D compared to the circle. After talking, we decided that it was really the use of highlights and shadows on the sphere that made it look 3D. 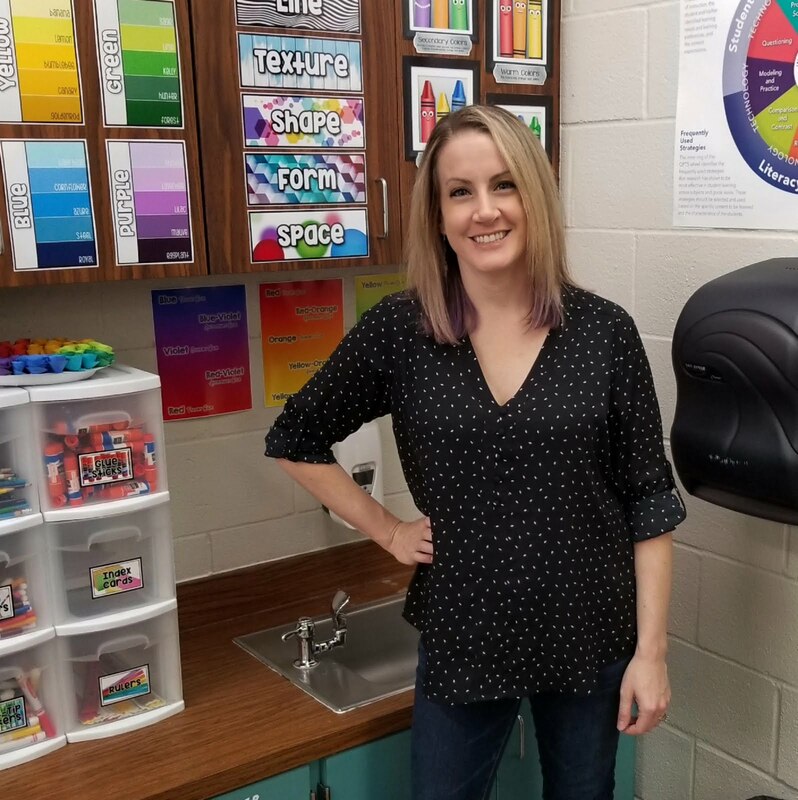 This led us into a conversation about value, tints, and shades as a tool to create the illusion of form. Then we transitioned to a PowerPoint I put together about the solar system and each of the individual planets (I included at least 3 cool facts about each - GREAT science integration). 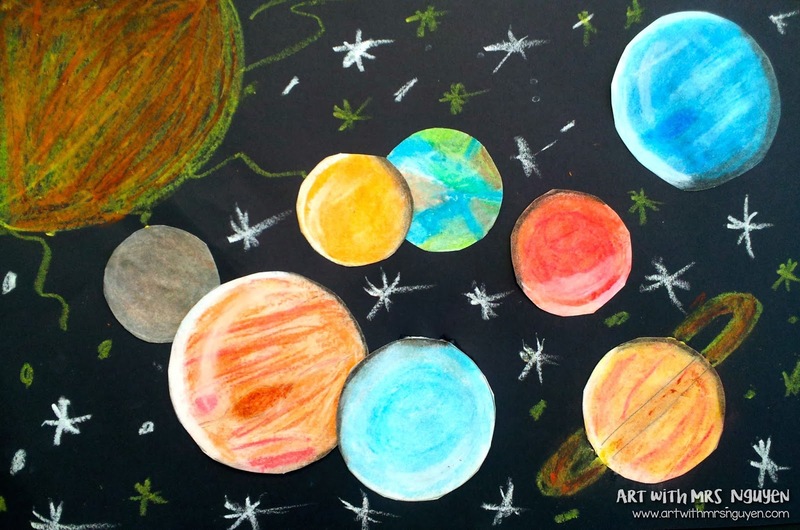 Using compasses, students drew 8-9 (depending on whether they wanted to include Pluto or not) circles on a sheet of white paper for each of the planets - they tried to size them relative to one another. 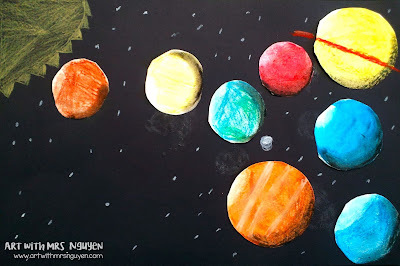 Then using oil pastels, they colored in the planets trying to use the correct colors for each planet and added white pastel to create highlights and black pastels on the opposite side to create shadows. Once these were finished, my students cut out their planets and glued them to a 12"x18" piece of black construction paper. 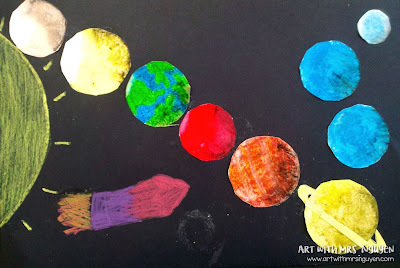 Then using construction paper crayons, students added a sun (the light source for the highlights) and any other details (planet rings, stars, rocket ships, etc.). My 5th graders really liked this lesson! At this age they're really into outer space and I think having that element really engaged my students. I think next time I teach this one I will give them a smaller sheet of white drawing paper for the planets so that when cut out they will fit better on the black paper.